Click on the sketches to enlarge them. This arrangement of lever reverse with the reach rod running under the locomotive axles was used on a number of 19thC GWR Classes. A big advantage of lever reverse was that the locomotive could quickly be moved from full forward to reverse - ideal for shunting. A disadvantage was that it was difficult or even unsafe to move the lever with the regulator open. A more conventional arrangement of lever reverse with the reach rod running just above the footplate. Lever reverse was also the simplest and cheapest system to build and maintain. Steam Reverse seems like an ideal solution, but many implementations, the GWR's among them, had a tendency to move away from the chosen setting so the gear would need constant adjustment. The actual control was a relatively small lever in the cab connected by steam pipes, but I don't have the information to sketch this. A lever reverse installation typical of the Churchward standard classes. The curved slot partway along the reach rod is a support. Note that, unlike the earlier design on the Dean Goods, the suspension link acts on the centre of the expansion link. This provides superior valve timing. See Don Ashton's pages on Stephenson valve gear for more on this subject. Its curious that the earlier inferior arrangement was retained on 5700 and 2251 classes. A typical GWR Screw reverse implementation. A significant advantage of screw reverse was that precise alterations could easily be made with the locomotive in motion. One disadvantage was that it took many turns of the lever to change from full forward to full reverse, which was very inconvenient for shunting. A 1940s implementation of lever reverse with Walschaerts valve gear on the 1500 class pannier tank. Lever reverse was the normal installation in the early days. Screw reverse was used on the Dean Singles, and possibly some earlier classes. 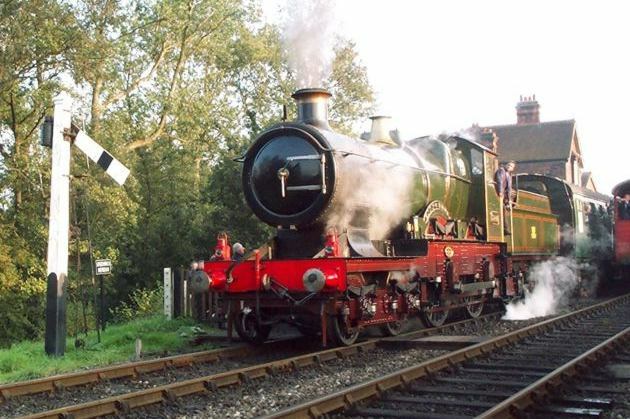 The first implemantation of steam reverse was on a Badminton class locomotive in 1898, but it was removed within a few months. It was fitted to new locomotives of a number of classes in the 1899-1907 period, notably various 4-4-0 classes like Bulldogs and Cities, and the 2-6-0 Aberdare class, but after that it tended to be removed from all but the Aberdares, which retained it until withdrawal. Churchward's two cylinder standard classes, including the Saints, were all introduced with lever reverse, but the 4 cylinder classes all had screw reverse. Passenger classes such as the Saints tended to be fitted with screw reverse after around 1907, and in some cases the earlier locomotives were converted. 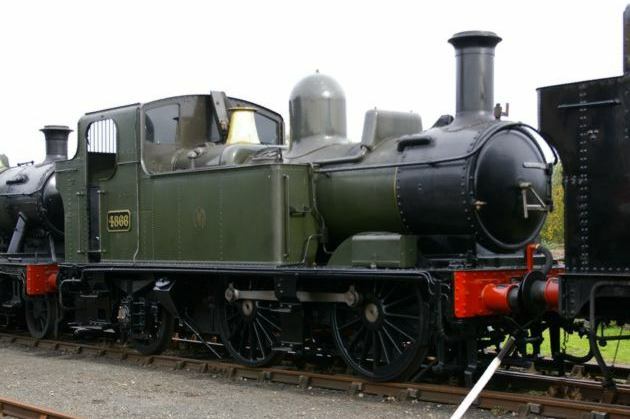 In the Collett era even mixed traffic locomotives tended to have screw reverse - one may note that the 2251 class originally had lever reverse but later had screw reverse fitted. In the end the GWR tended to use screw reverse for passenger locomotives and lever reverse for shunters and freight. The Collett era autofitted tank engines had screw reverse. In that context its interesting to note that the 1500 class had lever reverse and the 9400 screw reverse. Its also interesting to note that as late as the 1950s there was a proposal to refit the big 4700 class mixed traffic 2-8-0s with screw reverse, but in the end it was designed but not implemented.